If you wonder whether you're obese or just overweight, learning the facts about obesity will answer your questions and may even motivate you to take steps to get rid of those unwanted pounds.. The importance of doing something about being overweight or obese has more to do with health than looks. While it is easy to blame our extra weight on heredity, the biggest reason people are overweight and even obese is because they eat a diet high in energy dense foods, which are high in fat and/or high in sugars. On top of this, they are less active than the average person. The combination of poor dietary choices and lack of exercise leads to weight gain. If this becomes a lifestyle and isn't turned around, weight gradually sneaks on and the next thing you know, you're not just overweight; you're obese! It's bad enough when you look in the mirror and see you're overweight, or when you try to snap your jeans and feel like you're cutting off your circulation. Yet somehow we gradually accept being overweight, but obese? For most of us that term sounds more offensive, much like the days when people would say, "You're fat." Obesity is more than what you look like, it is a physical condition determined by your BMI (body mass index). According to the Centers for Disease Control and Prevention, if your BMI measures 30 or higher, you are considered obese. The thing is that BMI is not always accurate for people with higher muscle mass, so this is another factor that comes into play. It still isn't a black and white determination in every situation.. Along with BMI, another tool used to assess whether a person is obese or not is waist measurement. When combined with data from BMI your waist measurement can confirm obesity and predict the possibility of health risks associated with obesity. If your waist size if more than 35 inches for women and 40 inches for men, then you would be considered obese and at risk for weight related illnesses. Another tool that's used to determine body fat is also used to help determine whether or not you are obese. If you are a woman with more than 30 percent body fat you are considered obese. For men the number is 25 percent. The skin fold caliper measure body fat just below the skin. 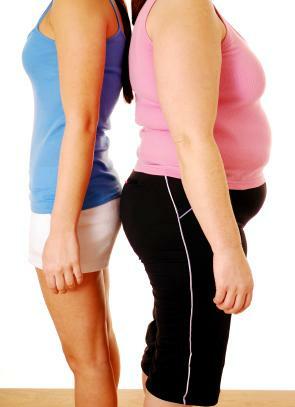 Obesity is one physical condition you can take steps to correct through diet and exercise. Taking this proactive approach can change the quality of life for obese people. Losing even five percent of your total body weight can lessen chances of developing some of the more serious health related side effects mentioned in this article such as high blood pressure and high cholesterol, and it may even reduce your risk of developing heart disease.